Northern California-based Monterey-Salinas Transit (MST) recently opened the first grouping of bus stops and shelters for its new JAZZ bus rapid transit (BRT) line. The system, which serves a 6.75-mile route between Sand City Station and the Monterey Bay Aquarium, will improve transit connections and cut commuting times roughly in half for riders. According to Carl Sedoryk, GM/CEO of MST, total BRT line completion is slated for March 2013. The route travels through Seaside, Calif., where many transit-dependent hospitality workers reside. As well, new stops will open near the area’s military facilities in addition to other local employment centers and attractions. The Federal Transit Administration committed $2.77 million to the $5 million project through its Very Small Starts capital program. The remainder is from California state bond funds. MST chose the name “JAZZ” for its BRT line in part for its universality. “One of our brand strategies was to develop a name that is easily translatable — jazz actually means the same thing in every language,” Sedoryk said. According to Sedoryk, “JAZZ” is also fitting because for county residents, it calls to mind the Monterey Jazz Festival — the world’s longest running jazz festival, which dates back to 1958. “The festival is a big part of our local community, and we like the idea of branding our service to jazz because the Monterey County Fairgrounds, where the jazz festival is held, is right at the center of our route,” said Sedoryk. When the agency approached the Monterey Jazz Festival staff, they found that the team was interested in developing a jazz history museum but lacked the building space. The two groups married their interests by collaboratively designing custom-built bus shelters. 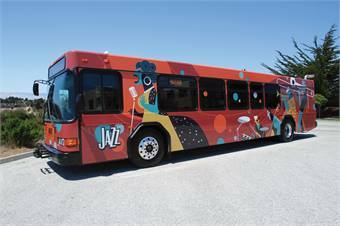 By March, each shelter for the 20-plus stops along the route will feature a different part of the history of jazz and the Monterey Jazz Festival. The shelters will also connect jazz’s history to societal history and include photographs from the festival’s extensive archive. The shelters will also display QR codes so riders can link to live performances and photo galleries. MST contracted internationally re-nowned Argentinian artist Pablo Lobato — who also designs for the Monterey Jazz Festival — to design BRT bus wraps. Buses used for the BRT line are Gillig 40-foot low-floor buses with ultra-low sulfur diesel. The project is more than just shelters, displays and buses, said Sedoryk. The transit agency is also upgrading the street and bus paths around the stations. Each shelter will also have GPS-enabled electronic passenger information signage indicating when the next bus will arrive. “The concept of bus rapid transit is to combine the high-quality service and speed of a light rail line, but using rubber wheeled buses to achieve that end,” said Sedoryk. The last phase of the project is to up-grade the traffic signals along the corridor to maintain dependability. If a bus is running behind schedule, they will get an extended green light at certain intersections. “Not only will bus travel time benefit, but people who are traveling on cars who may never ride the bus will see some benefit from the coordination and synchronization of the traffic signals throughout the corridor,” said Sedoryk.